Keith's Tree Service has professionals standing by 24 hours a day for your tree emergency needs. Keith's Tree Service is always available to provide emergency tree service. In an area with all 4 seasons where extreme weather conditions are almost a guarantee. Thunderstorms or ice storms can cause major damage to your trees. High winds or heavy ice can break tree limbs or topple large trees onto your property or even your home. Do you have a tree emergency that you need help with right now? Contact us and we will be there as soon as possible! 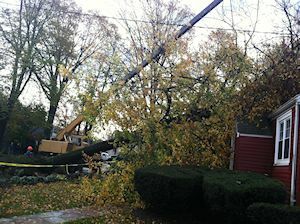 Keith's Tree Service specializes in assisting you during these hazardous conditions. We are available 24 hours per day, 7 days a week to help you with tree removal and clean up. Just call our 24 hour number, (617) 620 0361. We can come and assess your home or place of business damages within 2 hours, and can mobilize a tree removal crew on the spot. Our equipment operators and tree care employees are experienced in the delicate job of removing a fallen tree without further damage to your property. Is there a tree stump you have been meaning to have removed? Let Keith's Tree Service help with the removal. Keith's Tree Service provides stump removal for any size tree stump. We can remove your stump when we cut down your tree, or you can call us at a later date for stump removal. With our top of the line Vermeer stump grinding machines, we can remove any unsightly stump from anywhere on your property. For stump grinding we use self-propelled machines make it easy to access stumps in hard to reach places. Stump grinding is very affordable and unlike the older machines you do not have to drive a pickup over lawn to move this machine minimizing lawn damage. Let the us know what your plans are for the area and he can give you your best options. Our Customers intention for the new yard opening where the stump is removed will determine the specifications regarding how the stump will be removed. This will include how wide and deep to grind the tree stump roots. If a customer intends to re-plant, such as flowers, shrubs, bushes, or another tree, then the tree stump roots will need to be completely removed. Tree Removal - Keith's Tree Service has been offering tree removal to our customers for over 10 years! Learn what keeps our customers coming back. Tree Removal - Keith's Tree Service specializes in the event that a tree must be removed from your property. Tree removal can be a hazardous job in the hands of an amateur, especially trees that are close to your home. Keith's Tree Service has over 10 years experience removing trees from delicate or seemingly inaccessible places. Before we proceed will discuss with you the safest method for removing your tree and give you a free written proposal with specifications and price. Large Tree Removal - At Keith's Tree Service, we are experts in large tree removal. we dispose of trees in a careful and efficient manner, minimizing waste and damage in your landscape. The use of our company owned cranes allows us to remove problem trees with minimal disturbance to the surrounding landscape/property. When it comes to tree removal, our tree crews will remove the tree safely according to the needs of the service and customer. Our tree workers pride themselves on their ability to work together in coordination to bring the tree down without damage to your home or landscaping. The clean-up crews ensure that your property and service area will be neat and tidy throughout the entire job and upon completion. We can haul everything away, or leave the wood for you to split. Please ask us for other options. Keith's Tree Service provides 24 Hour Emergency Tree Service. In the event that a storm takes place and you have a tree hazard, Keith's Tree Service specializes in these types of scenarios. With over 10 years experience in providing emergency tree service, Keith's Tree Service has the resources and expertise to handle any type of tree removal. If a large tree is on your structure (home, car, etc), contact Keith's Tree Service to have it removed. Storms are very prevalent in the our area. Northeaster's season is upon us during the late summer and early fall months. Over the years, Essex, Middlesex, and other counties have been subject to a variety of storms causing hazardous trees to fall and create significant damage. Hazardous Tree Removal No matter how difficult your tree problem may be, you can depend on us for any tree removal job. Our cranes give us the ability to hoist trees and limbs over buildings and other large obstacles with ease. Trees that are decayed, are dying, or already dead are more prone to fall during extreme weather conditions such as high winds. This is why customers who have potential hazardous trees should take preventative action to have them removed before a storm strikes. 24 hour emergency service firewood - split and seasoned wood to be prepared in case of power and or heat loss. When you need commercial snow removal services in the area of Wakefield turn to Keith's Tree Service Company. Keith's Tree Service offers commercial snow removal service. We offer complete snow plowing for small or large commercial lots, streets and parking lots.. We generally contract our service to homeowners associations, commercial complexes, college universities, and government facilities.
. If our area encounters an extreme snow storm, we also provide snow hauling services by using our tree company equipment and trucks. Contact our office for rates and availability for this year’s snow season. Be first in line for our expert snow removal service this winter! Keith's Tree Service is now offering Seasoned and ready to burn. Wood Seasoning takes place when the moisture content in wood reaches equilibrium with the moisture in the surrounding air. Wood is split and stacked outdoors with good air circulation in a spot that's dry, sunny and open for nine to twelve months so it will be dry enough to support efficient combustion. Seasoned wood has a higher heating value than green wood. In general, because of its moisture content, a cord of green wood will weigh 70 to 100 percent more than seasoned wood. The time of year and the size of the wood pieces influences the amount of time that wood takes to season. You can help the process by properly stacking and storing your pile of firewood. The best way is to store it outside, under cover and close to the house for easy access. It should be stacked on a supporting base -- such as cement blocks, pallets or wooden planks. This prevents the wood from drawing moisture from the ground, allows air to circulate around it, reduces insect infestation and cuts down on the amount of dirt in accumulates. End braces or stakes can be used to keep the woodpile from collapsing; they can be built to measure accurately a standard cord. The firewood we offer is local and come from our tree removal service. Our customers have the option to keep the trees we cut or have haul them away. We cut, split and let it season in the most favorable conditions. We offer both seasoned and unseasoned firewood. Please call Keith at 617 620 0361 for details. Keith's Tree Service uses its own cranes when removing trees for our Northeast US customers. We also make them available for rent. Keith's Tree Service uses its owns cranes, and employs professional crane operators who work the tree business daily. This provides an advantage over our competitors. Having crane operators that do tree business everyday is very important because they have the expertise needed to get the job done right. Companies that contract out and hire crane operators are at a disadvantage. Using a crane for tree service and removal is much more complex compared to standard crane operating usage. A climber who is cutting down a tree must maintain highest communication with the crane operator. Large tree limbs, especially Oak trees are very heavy, and when the cut is made a branch sways. A tree removal crane operator must possess the necessary skills needed to complete a large tree removal job in a safe and reliable manner. Crane service helps to make tree service much more cost effective and improves overall job efficiency and timeliness. 3 different size cranes available by the hour. Please call or email us for pricing and availability. Keith's Tree Removal Services with Headquarters right here in Wakefield (781) 224 9995 dedicated in serving our neighborhoods.